More information is good for North Koreans. But real change will require greater exposure to the outside world. The conventional wisdom is that there could be nothing more dangerous to North Korea’s current leadership than the penetration of information into the country from the outside world. A new empirical study released last week by Nat Ketchum and Jane Kim entitled “A Quiet Opening: North Koreans in a Changing Media Environment” draws on surveys and interviews from North Korean refugees to show that information penetration is changing North Korea, but the result has been an evolutionary change of circumstances in North Korea rather than uprising or revolution. Almost four-fifths of survey respondents indicated that word of mouth is the most common means by which information is disseminated in North Korea. Two-fifths of respondents identified DVDs and official state media as primary sources of information, and about one-fifth of respondents acknowledged South Korean and foreign media as important sources of information in North Korea. This data confirms that North Korea is a society where rumors travel fast. Prohibitions on “horizontal” transmission of information are increasingly ineffective. The state media is increasingly challenged as an official source of information and entertainment, not only by rumors, but also by better produced propaganda-free entertainment offerings from South Korea. An irony of the report is that a primary catalyst driving consumption of South Korean cultural products in the North appears to be the sons and daughters of the elite, who have the means to secure and disseminate South Korean materials inside North Korea with relative impunity. Additionally, lowered prices of TVs and DVD players have enabled the spread of South Korean music and dramas to a broad North Korean audience. The growing popularity of these products is a telling indicator of the failure of North Korean propaganda and the potentially powerful influence of South Korean culture, which is changing the behavior patterns and vocabulary of North Korea’s presumed future leaders and people. But the report also reveals that North Korea’s political system has shown sufficient durability and cohesion to resist upward social mobility for non-elites, even if they have experienced economic success in North Korea’s burgeoning markets, participation in which itself is a major means to access outside information. 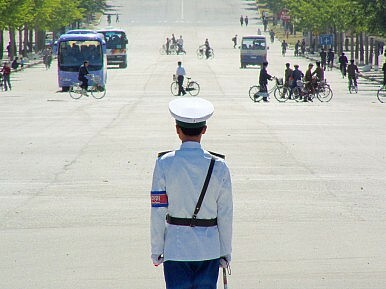 North Korea has used outside media for its own purposes, even by inviting external media representatives to cover – and by extension, to validate – critical events such as the September 2010 Party Conference, the funeral of Kim Jong-il, and the 100th anniversary of the birth of the founder, Kim Il-sung. This strategy backfired when North Korea allowed extensive foreign media coverage in advance of the failed April 11 satellite launch, which provoked an unprecedented admission of failure. Make no mistake: information penetration is a force for transformation of the North Korean system. But the timeline for such changes will be frustratingly slow unless additional measures are undertaken to expose North Korea to the outside world. Ultimately, greater change will require the sons and daughters of North Korea’s elites to do more than just copy South Korean dance moves or popular expressions; they will need to think like South Koreans and the rest of the world. This is why we need to provide more opportunities for North Koreans to be educated abroad, so that they can truly absorb the information necessary to move North Korea toward reform.